Presented in a fun and creative way, team building exercises challenge your team members to work together to solve certain tasks. The NFL draft, which concluded recently, is an interesting concept. Over the now three day event, teams hope to find the missing piece to their championship puzzle by selecting players from the college ranks. These players are then thrust into their new surroundings and are expected to help the team improve almost instantaneously. You have to ask yourself, “Is it really that easy?” The short answer is no. Great teams are not built overnight. They are formed through hard work and determination. This is where Team Building can help. Shout it from the Rooftop: Not really, but you shouldn’t keep these events a secret either. Your team will better respond if they know what’s coming and are able to prepare for the event. Besides, if you are keeping the event secret because you fear that your group will not like the event, maybe you should choose a different event. Team building should be a positive experience for all involved. Pick Team Building Teams Before You Go: Healthy competition can be a good thing and splitting your group up into smaller teams can really make events even more entertaining. By selecting teams ahead of your event, you give your group the opportunity to get organized, choose matching outfits, and really make the team building event their own. They will start collaborating before they even show up to the event. Trust the Professionals: Team building is not a DIY (do-it-yourself) type of event. In order to fully reap the benefits, you should trust a professional company, like Terrapin Adventures. Terrapin Adventures is conveniently located in Howard County, Maryland, between Baltimore and Washington DC. 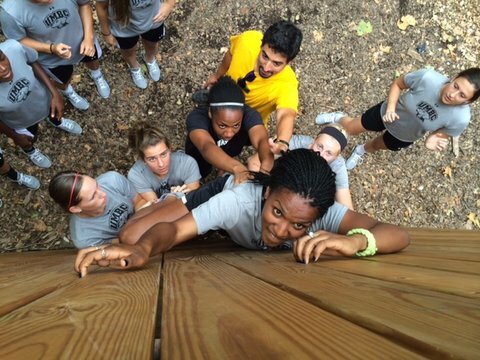 We offer both custom onsite and offsite team building solutions. Presented in a fun and creative way, team building exercises, like the Bull Ring (below), challenge your team members to step out of their comfort zones and force them to work together to solve certain tasks. The Challenge: Carry a ball from Point A to Point B using nothing more than a metal ring and string. Initially easy, there are several ways to increase the difficulty of this task, requiring greater problem solving and greater communication. Lessons Learned:This fun team building exercise utilizes physical movement, coordination, cooperation, communication and, of course, PATIENCE. The goal is to get your team talking and working as a cohesive unit to tackle the problem at hand. How will your team handle this challenge? Will they work together or will they struggle to work as a cohesive team? Who will take on leadership roles? The Wild Woozy requires a tremendous amount of trust and teamwork. The Bull Ring is just one example of the many different team building exercises that Terrapin Adventures uses to help your team reach their full potential. This entry was posted on Friday, May 1st, 2015 at 3:03 pm. Both comments and pings are currently closed. I wouldn’t have thought to pick teams for a team building trip ahead of time. I can see how just doing that would give them a bit of time to make that connection and make the event a bit more successful. The success of something like that really can come down to small details.